Most Mahjong games give a flat and simple layout. However, The Great Mahjong is completely different. You will be presented with an amazing 3-dimensional graphics environment. You can even create your own layouts, even though the game is already providing approximately 150 mahjong layouts for your fun. The goal in this Great Mahjong is quite simple, that is you must select (click) two identical cards until all the cards on the screen is out and you win. The two identical cards must have either its right or left side completely open and there can not be any mahjong card on top of it. 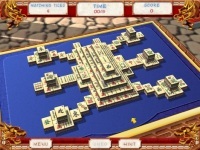 The fun of the game is its 3D environment, you can play mahjong board by right-click-dragging to any direction you want. Play chess for fun against the computer. Master basic and advanced rules of chess with Amusive Chess.